I have been reviewing products and services for quite some time and I can't believe I forgot to write about Uber! So what I usually do when I have multiple events and meetings to attend to, I drove all the way to a first event, park, and hop inside a cab to transfer from one place to another instead of having to stress about looking for another parking slot! And to be honest, I have a lot of scary stories to share when it comes to public transportation so I'm very particular with cab services! Check my mobile phone I have all the list of Taxi service numbers! They are very convenient but I can only book a cab 1 out of 10 times I tried! So when Uber is finally here in the Philippines, I downloaded the app immediately and thanked the heavens for the gift of convenience and safety. Here's me sharing my first ever UBER ride from FORT to Makati. What I love about Uber is the fact that the drivers don't get to choose their passengers as they don't know where you're heading until they get to talk to you! With Uber, I don't need to worry about not enough cash or change as they charge you through your credit card! You get a summary of your ride sent to your email like shown on photo below. The best part about the ride? The clean cars, very courteous and professional drivers, and you get the details of the drivers before hand! I always screenshot the name of the driver and the cab plate number and forward it to Mr. AMW just for safety! If you are on a budget, you can always go for UberX and I pesonally think they are not much of the difference with Uber. 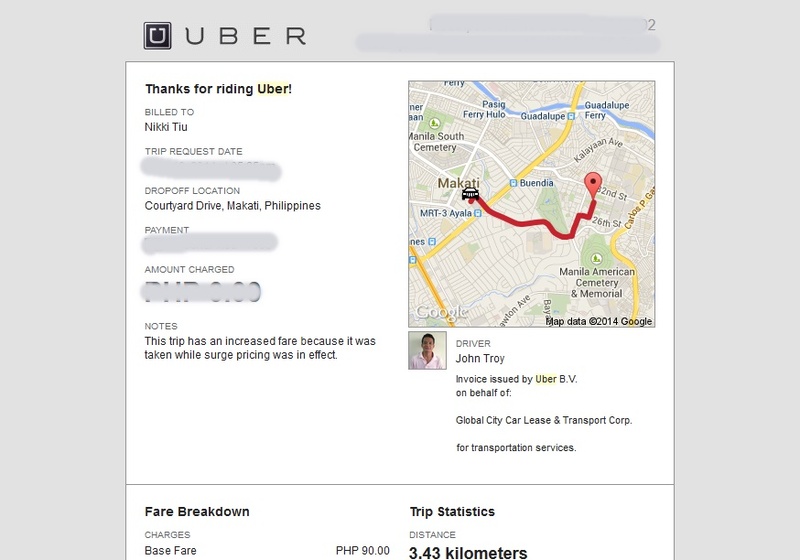 My UberX ride within Fort Bonifacio (my second) costs less than Php100.00 which isn't bad!!! It's almost the same as regular cab fares! I am sharing this short post because this is really awesome for commuters out there who has been harassed so many times by unprofessional cab drivers! Dowload the UBER APP from And if I may add, please put in Code UBERASKMEWHATS to get your FREE Php200.00 Uber Credits on your first trip! I am not sponsored by Uber to create this post but I'm very excited for you to try an alternative and safe way to commute! Especially on days you just need a break from all the stress! SOOO SOOOO glad Uber is still here. I'll try them soon enough!